As a child, I hated cranberry sauce. That weird jellied substance that still retained the shape of its tin can freaked me out. Only dog food retains the shape of can, and I didn’t understand what this sweet substance was doing on my Thanksgiving plate. The first time I tasted organic homemade cranberry sauce, I was in heaven. I had no idea that was what it was supposed to taste like, and it wasn’t can-shaped (did you know tin cans contain BPA?) Besides, homemade cranberry sauce is super easy to make, so who needs a can? It is easy to find organic cranberries at coops and health food stores to make your own sweet sauce to complement your Thanksgiving feast, whether vegan, vegetarian, or omnivore. Plan ahead! Cranberry sauce needs to chill in your refrigerator for at least three hours before your feast. It is best to make it the night before Thanksgiving. Boil for at least five minutes longer, or until the cranberries pop. 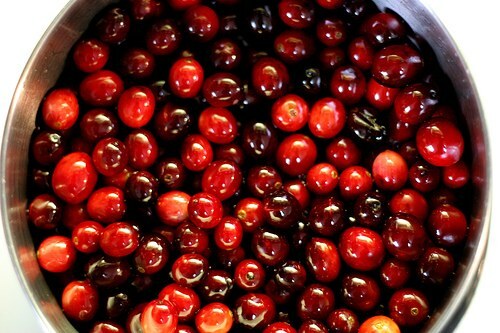 The cranberries must pop to release the natural pectin that will thicken your cranberry sauce. Refrigerate for at least three hours before serving. « World Diabetes Day and a Moment of Outrage: Pfuck Phiser? Excellent-glad to have found you! Oh My! It's Greek Walnut Pie! Downshifting Week-Slow Down and Green Up! Is Renting Textbooks From Netflicks Eco-Friendly?